Some years ago, I wrote about my tail(s) of woe with HSBC here in Oman. I'm sorry to report that my experiences with HSBC here have gotten no better, and was just wondering if anyone else is experiencing the same ridiculousness as me? So in my last post about HSBC, back in 2011, I swore I'd never take a loan from HSBC Oman again, and I've stuck to this, and have largely had a pain-free experience with them. They're still sending a monthly transfer to another account in my name in another country, 7 years after I setup the transfer instruction (to last for only 2 years), but I don't mind the money going out to my overseas account each month so I have not complained about it. Last year, I noticed HSBC launched a new credit card for their customers here in Oman, they call it their HSBC Advance credit card which among other things has 2 rather attractive benefits that I would like: no annual fees, and airport lounge access to a number of airports around the Middle East. I walked into the MQ branch last year, in August, and stated I wanted to apply for this credit card, filled in a form and was told it'd be about a week. In September I went looking for the card and was told I had not actually applied for any credit cards at all! Yup, I just imagined it all. Deciding that perhaps the MQ branch was not the best place to apply for a new credit card, and upon discussing the situation with a colleague, I was recommended to go and see a Premier account manager at the Al Khuwair main branch (the one with the gold doors). I was given a name and number of a Mr Simon and went in to see him. I'm not actually a Premier account holder, but after I'd explained to him on the phone my predicament he said I should come and see him and he'll sort me out. Hopes and expectations were high, so in mid September (2013) I went to see him. He looked into my account and said I already had 2 credit cards with HSBC and so I needed to cancel at least one, or dramatically reduce the limit on the card, so I could have enough "credit" to get approval for a new credit card. I told him to cancel my Visa gold card, and we filled in a form for that, and I filled in another form to apply for the HSBC Advance credit card I wanted. Then I was asked if I'd like to purchase any investment products with HSBC... err no thanks, just the credit card if you please! 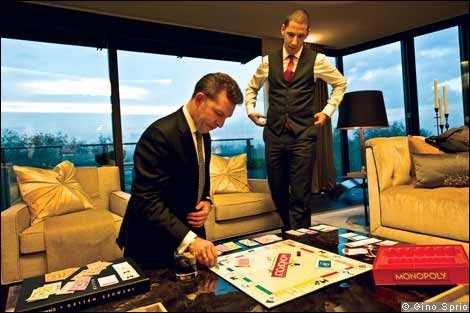 October comes, and I ring up Mr Simon and ask what's going on with the cards - he says to pop in so we can look into it. I do. Would I like to purchase any HSBC investment products again? NO! Just the bloody card please! I can safely report to you that I never did get the damn credit card, and the not very helpful Mr Simon left Oman earlier this year too. 2014 started off quite a busy year for me and before I knew it, it was May and was joining the Abandoned Dad's brigade as the wife and kid buggered off to somewhere cooler. I decided to have another go at applying for that elusive credit card. I really wanted lounge access in Dubai! By this time, my Mastercard had gotten really badly cracked but I held on, I knew I was going to cancel it as soon as I got the new card, and didn't want to go through the pain of attempting to get a replacement card. I filled in another form to apply for the Advance credit card and figured I'd check in when I returned to Oman in late June. Early July I head into the bank because my ATM card decided to stop working in every HSBC ATM (but worked in every other banks ATM machines). I met with a very professional lady in the MQ HSBC branch and she filed my paperwork and I got my new ATM card very quickly, a week or so. I went back to see her about the elusive credit card but, alas, she was gone. I met with another guy, and he told me I needed to fill in another form to apply. Yes, I know, I'm stupid. I should of created a fuss but I try not to blow my top here because it (and I swear it's true) seems to just make whoever it is you're venting at vow to try extra hard to not do whatever it is you're asking them to do. So I filled in the form again. 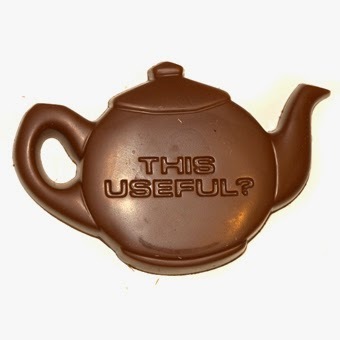 A chocolate teapot, which is what most HSBC staff I encounter are akin to. More time passes and I go back to the MQ branch again in August and meet another guy who's actually helpful, he is the first person to point out to me that my Visa gold card that I had cancelled a year before, was actually still active. He also stated I had no salary transfer letter or Employment Visa details on file. We fill in another form to cancel the Visa account and I go and get copies of my passport and a salary letter whipped up - I finally feel like I'm getting somewhere. Another week passes and I go back to the branch to find out whats going on. My application is being held because I already have a Mastercard Gold card and I can't have more than 1 credit card - WTF?! I explain I had 2 Gold cards, one Visa and one Mastercard for the last 7 years. Impossible he tells me. I demand to see someone else, hoping that they'll have a bit more knowledge than the man in front of me who appears to make up rules on the fly. I have to go back later in the day and meet the helpful man again, the one who pointed out the Visa wasn't shut down properly & the employment paperwork was missing. He tells me that my DBR is absolutely fine and I can have another credit card no problem. Leave it with him, he'll get it sorted. September comes, and I get an emailed letter from HSBC, telling me that in their continuous efforts to piss me off improve my banking experience, they are phasing out my Mastercard Gold card and reissuing me with a Visa Gold card instead. I figured it was a bulk mail and couldn't possibly apply to me. I get a SMS message from HSBC 21st September informing me that my Credit Card has been issued and I can collect if from the customer collection office in Khuwair in 5 business days' time. SUCCESS! Wooo hoo! I felt like I had finally won in my battle to get the bloody lounge access no-fee credit card. I even gave HSBC 3 full weeks (eid happened) before heading down to the collection point, just to be sure. Nope, the cards not there yet, come back tomorrow they said. I came back 2 days later (16th October) and am handed an envelope. I'm excited, so excited to finally get the card, I rip it open and what do I find? A replacement Visa Gold card, and another letter explaining my Mastercard Gold card is to be deactivated within a month. Let's recap shall we? In 14 months, I've cancelled the same credit card twice (and been charged an annual fee for it too), had my active credit card cancelled and been issued the same card I had already cancelled twice, applied for the same new credit card 3 times and been consistently given the run around by various HSBC staff members. Why don't I quit HSBC and go to another bank? Because my salary is paid in, I know the ATM card works in the UK & Canada, I have monthly transfers, and I am quite frankly afraid to face the same nonsense with another bank. Really, how hard is it to just issue a credit card? And I never did get my bloody Al Fair vouchers either! Have you had any crazy experiences with HSBC Oman lately? If it's any consolation I have applied for a new bank muscat card about eight times and am yet to get one. I have also stopped bothering to ask for online access to my own account because I think the leftovers from Oman Air's Sindbad card programme are working there now. They are to banking what Myra Hindley is to babysitting. I am a Bank Muscat Customer for the last 8 years and used one international banks credit card for couple of years. Honestly Bank Muscat service is far more superior than the MNC one. There had been occasional issues but the staff were always able to sort it out. And the call center services were also readily available most of the time. We too suffer from the debit card working at every other ATM in the country except for the HSBC ones! Makes me laugh every time! Been banking with HSBC since 13 years. Totally Agree that the service quality has declined big time. Its reaching a point where we are considering a change of bank .We have exactly the same issue with the advance account and the credit cards. They lost our first application forms . Staff seem to be totally unaccountable for their actions. Its unfortunate to see HSBC go down this way. Their recent losses should wake them up or else the Ships definitely sinking . Hey , I cant imagine what your going through just to get a credit card and back in the USA its the other end of the scale where I keep getting pre approved cards with upto 5% cash back and cruise or airline vouchers without applying for them. Okay to solve your problem get an AMEX GOLD CARD they charge 40 Rials a year and you can get 3 additional cards and they have middle east lounge access. I have had mine for 4 years now and its just perfect. The best thing I ever did for myself was leaving OIB/HSBC as soon as the "seamless" merger that they rabbited on about took place. NBO is such a pleasure in comparison. I had 22 years with OIB and had no problems. It wasn't until HSBC turned up that everything went south. Not perfect- but have always resolved any issues within 24 hours. I suggest you change banks, get a debit card, change your salary payment, then start the process of closing your HSBC account, as this may take more than a year! Ditto, 4 month saga in all between getting the card which involved multiple visitis to sales rep guy reproducing all the paperwork I know they had on file and managing to get it linked via online banking to my current account. Even had hsbc staff tell me to avoid msq branch if possible. They have long long way to go in the customer service stakes relative to other banks and companies I've dealt with elsewhere...something like this would probably take a couple of days to sort. I am not an HSBC customer. But I can relate to your troubles as a customer with Standard Chartered Oman for 5 years and running. Every single application of mine, whether for an ATM card or online banking or loan, has been a nightmare. The first year of banking with them, which is when most of these applications take place, was so bad that I considered shifting to Bank Muscat where my husband seemed to get more than satisfactory service. But having gone through all that pain, I decided to stick on and found that if all I wanted was to get my salary credited and take out that salary from any bank ATM, SCB was okay. Countless instances of incompetence by HSBC. They make my blood boil as HSBC Jersey are a joy to deal with however HSBC Oman are the most unprofessional institution I have ever dealt with. Waiting for my Advance credit card as well.. But I give them a peace of my mind at times... Helps a bit.. I am not a contrarian by nature, but.....I applied before I arrived here to set up an account with HSBC and after a bit if a nudge from me there was an individual there who heads up 'Customer Experience' and has been really helpful - he has set it all up for me and is just waiting for me to pop in with my WP and ID and I am all go. I am glad things are going well. However, in Oman people always tell you no problem just stop by and it will be ready or I'll send it to you soon. I have had numerous experiences in Oman where people said no problem it will be done soon and it turns into a problem. I remember the days when I used to live in Muscat, had a brand new credit card with NBO, just before we left for a 10 day trip to Canada and USA. Arrived in Toronto and went to the hotel ( thank God we prepaid the hotel), was asked a card for security deposit, and produced the new card. Sorry sir, it is not working. What do you mean, I just got it. Sorry , it does not seem to work. Had to fork over US 100 for deposit, was scared since I had only a little money since we had more than 3000 US in the card. Had to spend 3 hrs on the phone talking to card services in US, Amman and then finally in Muscat. Oh, your card has not been activated. I said , I got it 3 weeks ago. Your fault, I was told , since you did not check whether it was activated. Speechless. I asked politely, can you please activate it now, I am in Canada and I need it activated. Yakki, check tmw if it is activated, will set up the process and click. It was activated , thank God, came back after the trip and cancelled the card with them and moved to Bank Muscat and did not have much problems after that. HSBC in Oman are brilliant, not sure what all the fuss is about, the ladies advise the process for new cards, etc and to the day it happens. Moved from Advance to Premier, new credit cards for me and my wife, all arrived easily and within a couple of weeks, then the old ones were deactivated. Every international transfer has happened within 2 hours (to UK), every query addressed promptly and without fuss. I think they are wonderfully simple to deal with, perhaps because I go in fully prepared with all copies required, fresh salary transfer letters, etc it helps. Loan sorted in three days, paid off old loan within 24 hours, all very easy. I think it is you Mr. Sythe and your attitude which may be the issue! Just saw the March 22 comment here and all I can say is you have been incredibly fortunate with HSBC. It took them 6 months to open my accounts - nothing clever, no credit cards just a regular account. I spent days in MQ, Qurum "Premier Banking" (sit down while we ignore you for a few hours) and Al Khuwair trying to sort it out with multiple copies of passports, resident cards etc etc. As a consequence of their incompetence I don't have the confidence to actually pay any money in but my wife uses it. Got a pile of new cards a few months ago together with secret activation PIN numbers. Guess what? The PIN numbers only work for some of the cards! What kind of joker are you...asking for details on the internet totally unsolicited. Bank Muscat... the worst bank EVER! They are crooks or idiots. Waited for my debit card for 8 weeks. Got 7 rials deducted from my account for a credit card I don't own... TWICE! The first time it cost me 5 rials in phonecalls to get back 7 rials. Now the same problem and since I am abroad now, have to wait to sort it out once I am back.